With all the turmoil in the world, let's take a minute to enjoy something sweet. That's right! July 20th is recognized as National Lollipop Day (a colorful, enjoyable, and unofficial U.S. holiday of sorts). In 2012 See's Candies made the world's largest lollipop weighing in at 7000 pounds. The original lollipop machine manufactured 40 lollipops per minute while modern machines make nearly 6000 per minute. The true origin of the candy on a stick is debatable, but many give credit to George Smith, who trademarked the name lollipop in 1931. It's believed he named the candy after a horse he admired. 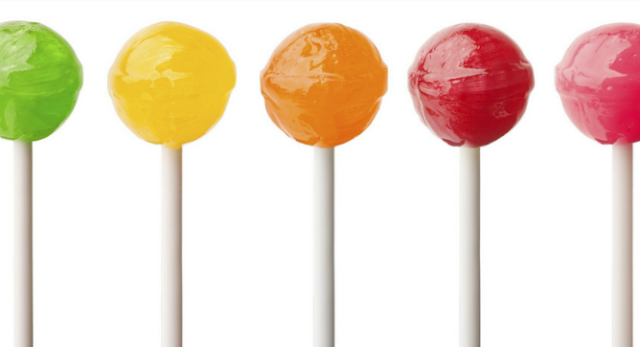 There are some "adult only" lollipops that contain various ingredients such as alcohol, dietary aids, and INSECTS. Blech. In 1939 the Wizard of Oz movie introduced us to the Lollipop Guild. In 1969 Tootsie Roll gave us the commercial asking, "How many licks does it take to get to the center of a Tootsie Pop?" I totally agree. We need one of these very sweet days to help us through November. Thanks.